It has been anticipated for some time that the new mental Capacity bill when it was eventually issued was going to incorporate provisions for the overhauling of the Wards of Court System as we have known it. The Bill which is called the Assisted Decision-Making (Capacity Bill) 2013 has now been issued and it does incorporate proposals for changes to both the Wardship system and the Enduring Power of Attorney system that we have historically been working with. I have been asked to review the Bill and to comment on the proposed changes in so far as they relate to Enduring Powers of Attorney and Wardships and to suggest how those changes may impact on us in practice. In doing so I am conscious of the fact that there has already been much commentary on the provisions of the Bill generally and that many bodies such for example as the Centre for Disability at NUIG, The Law Society and others are making additional submissions to the Department of Justice on where certain aspects of the Bill should be altered. I do not, in the main, propose to cloud my current discussion with reference to changes that may have been proposed as unless they are implemented the bill will stay as drafted. I will turn specifically to the sections of the Bill dealing with Wards of Court and Enduring Powers of Attorneys shortly. Firstly, and in order to give some context to what is proposed I want to draw your attention to the provisions in Part 8 of the Bill. These are the provisions regarding the creation of the Office of the Public Guardian. This is intended to take over from and replace the Wards of Court office. That part of the bill brings in a range of new measures that will impact on Enduring Powers of Attorneys and Wardship issues and it would be important to be familiar with same in the context of advising clients. There are many provisions in the Bill as regards the setting up of the Office of the Public Guardian and how it is intended to work, as well as the authority it will have in relation to the various new forms of assisted decision making arrangements that are provided for. And S56 (m) allows the Public Guardian to act on complaints which the guardian believes have substance and to make an application to the court, (which is defined as meaning the Circuit Court), or High Court under the act. 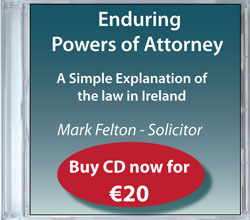 Part 6 of the Bill deals specifically with Enduring Powers of Attorney. This part of the Bill will affect all existing Enduring Powers of Attorney that are not already registered under S10 of the 1996 Act by the time the Bill is enacted. The new provisions acknowledge that whilst it may be the case that someone is losing their ability to manage their personal affairs, they may still be able to manage their personal welfare. This of course is in line with a move towards a functional assessment of capacity on an issue specific and time specific basis. The Bill, in much the same way as the 1996 Act provides for the making of regulations by the Minister as respects enduring powers of attorney these are set out in S40 (3) of the bill . In so far as there is reference to the Guiding Principles they are set out in part 2 of the Bill commencing at S8. The section talks about the “relevant person” and introduces a statutory presumption of capacity in favour of that person. (a) an attorney under an enduring power of attorney that has been registered shall at least once every 12 months prepare and submit to the Public Guardian a report as to his or her functions as such attorney. (b) Every such report submitted to the Public Guardian shall be in such form as may be determined by rules of court and shall in particular include details of all expenses and remuneration paid or reimbursed to the attorney concerned for the donor concerned. This is a new provision which seeks to ensure greater transparency in the manner in which attorneys are managing the affairs of the donor. It will be important that the attorneys obligations are clearly set out to them at the time the EPA is being signed so that they are fully aware of the new obligations they will be faced with after the power is registered. In so far as personal care decisions are concerned the provisions of S41 of the Bill sets out the scope of the Attorney’s authority under the Bill in respect of the personal welfare of the donor. In a general sense these provisions are much the same as we have used to date under the current 1996 Act.However there are some changes proposed. For example the section allows a donor to “confer authority on an attorney for a donor to make any decisions about the donor’s personal welfare or specified matters concerning the donor’s personal welfare. There have been questions raised about this provision in particular as to whether or not it recognises the donors right to autonomy and self-determination in so far as it might result in a situation where a donor had made their views on healthcare very clear to their attorney in advance to include their views on whether or not they wanted to be given life sustaining treatment, only for the donor to find that they were not then permitted to have those views upheld under this provision. (c) the act is a proportionate response to the likelihood of the harm referred to in paragraph (b) and to the seriousness of such harm. This is a new provision in respect of Enduring Powers of Attorneys and it will be interesting to see how it is dealt with in practice. In reality, it may well be the case that most instances of restraint will take place in private settings where there is no one there to monitor the situation. It will be interesting therefore to see the extent to which there may be many if any complaints brought about the over use of restraint by attorneys in due course. There is an acknowledgment at S41(6) that the attorney does more than restrain the attorney if they deprive them of their liberty within the meaning of Article (5) of the European Convention on Human rights. Although I am only quoting briefly from that Article it says that. 1. The application will be made to the office of the Public Guardian as set out in S 46 of the Bill. 3. If following those enquiries the Public Guardian is satisfied that there are valid grounds for the making of an objection to the registration they SHALL apply to the High Court for a determination as to whether the instrument should be registered. As usual I would expect that the parties will be fully entitled to be represented in the High Court if there is an application for determination. S52 (7) is also worth noting. It provides that on an application to register an Enduring Power of Attorney, if there is an objection to one of the attorneys who is applying to register the EPA, but not to the other proposed attorney(s) the Public Guardian can proceed to register the EPA notwithstanding the objection to one of the attorneys, and then can make an application to the High Court for a determination as to whether or not the instrument should be cancelled. Wards are referred to as Part 5 of the Bill. S35 makes provision for an application to be made for the review of the capacity of a ward who has attained the age of 18, with the consent of the wardship court, at any time by either the ward or such other person who it appears has the necessary interest or expertise in the welfare of the ward. Under the provisions of S35 (2) all existing Wards of Court will be subject to a review of their capacity within three years of the coming into force of the act. The purpose of that review will be to enable the Wardship Court to determine if the relevant person does or does not have capacity and to make relevant decisions on their behalf according to the finding. S35(b) (I) & (ii) make provisions for the Wardship Court to make directions to in respect of any Ward who it finds does not have capacity. It can make directions as regards the appointment of a co-decision maker for the ward as provided for under the terms of S15 of the Act. Others will be discussing the concept of the co-decision maker and that persons role in relation to the relevant person for whom they are appointed as a co-decision maker and I will not be doing that here. S36 of the Bill allows the Wardship Court to transfer existing adult wards to the Office of the Public Guardian which office will then become liable for the relevant supervisory role as set out under the Act, such that the Public Guardian then will have to exercise its functions in respect of that person and make the relevant provisions for them as set out. The Office of the Public Guardian will thereafter be responsible for the oversight of the former wards and the co-decision makers who are appointed to assist those parties will be accountable to the Public Guardian and the courts in the manner as set out in Part 4 of the Bill. These provisions in relation to the review of Wards of court and their transfer to the Office of the Public Guardian apply to wards who are not in involuntary detention. There are separate provisions at S68 and S69 of the Act designed to deal with Wards of Court who are involuntarily detained in an approved centre as defined in the Mental Health Act 2001. In those circumstances the Bill provides that those Wards cases are to be reviewed “as soon as possible” without being specific as to a precise time frame. These specific provisions apply to people who are detained under the Mental Health Act 2001 to whom the provisions of this act are not deemed to apply and so these provisions are separate to the general review of Wards of Court and transfer of their oversight to the Public Guardian as provided for in the act. I propose at this stage to leave the matter there. I will say in conclusion that I am aware that various amendments to these proposals have been made to the Department and it therefore remains to be seen which of the amendments are accepted and incorporated into the final version of the Bill and then enacted.